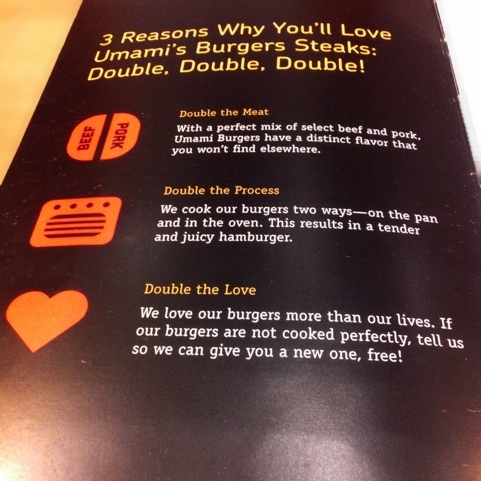 If you like Japanese food and burger steaks, then you had best head over to Umami Hambaagu House fast. It’s got all kinds of amazing burger steak goodness! 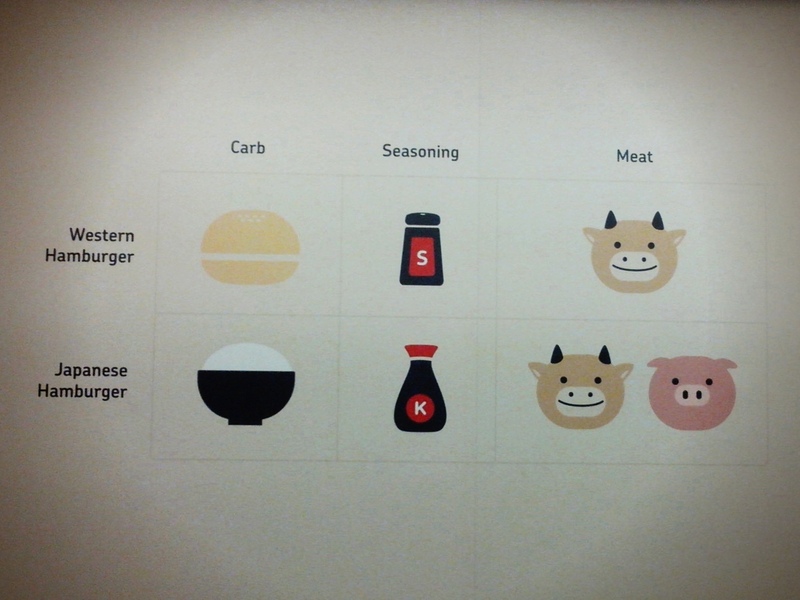 So why choose Umami Hambaagu House? 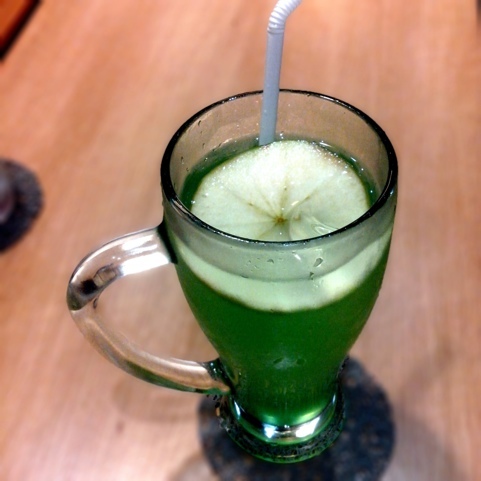 We ordered 3 kinds of burger steak: Maison du Japon, Ropponggi Hills and Yakuza’s Choice and 2 kinds of drink: Green Apple Soda and Tomato & Peach drink. 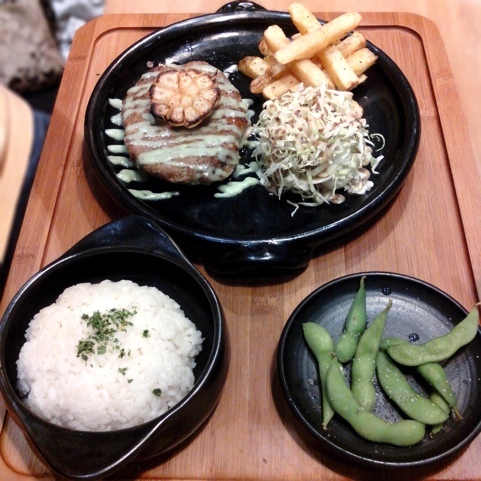 All burger steaks are served with steamed edamame, french fries, rice and unlimited cabbage salad in roasted sesame dressing (which happened to be smothered in dressing that has been my palette’s recent favorite). I actually finished 4 servings of this effortlessly! 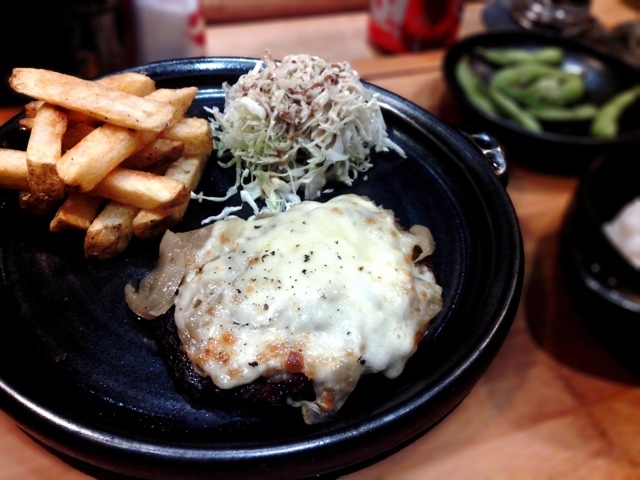 Maison du Japon (Php340.00) was juicy, topped with caramelized onions and gruyere cheese. The sweetness of the caramelized onion and the saltiness of the cheese worked together with the simple yet flavorful burger steak. The picture does not do justice to how awesomely cooked the patty is. But when you cut into it, you’ll see the juice. 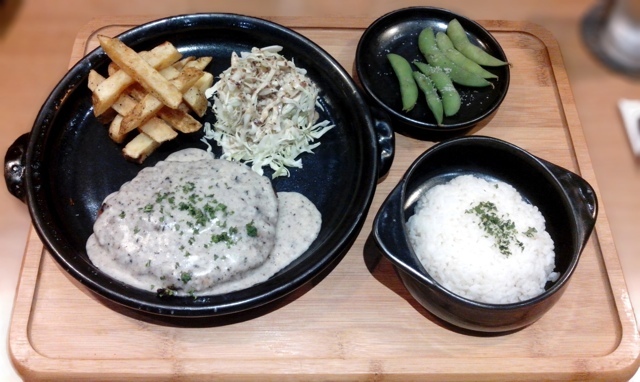 Roppongi Hills (Php420.00) is a burger steak smothered with truffle cream sauce that tastes like thickened smokey mushroom soup. The truffle cream sauce worked lovely with the burger steak and french fries. My son loves garlic so he went for Yakuza’s Choice (Php355.00) – a thick juicy burger patty with streaks of wasabi-mayonnaise and topped with roasted garlic. He adores garlic so much that he actually zeroes in on each garlic and eats it separately. His order got me quite curious so I decided to taste his food. The flavor of the wasabi was very subtle as it was mixed with mayonnaise already. 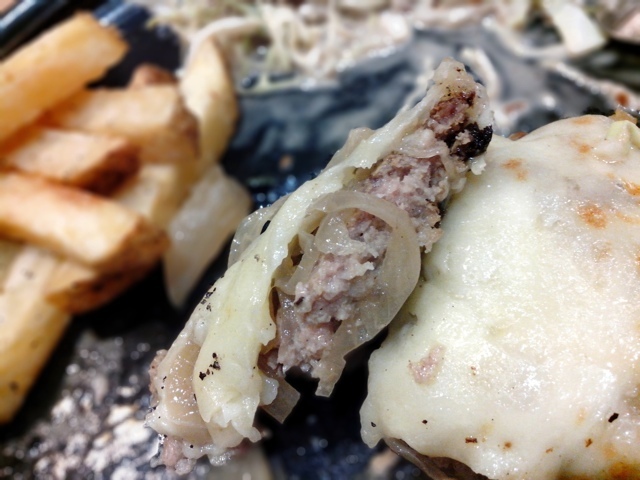 I was expecting big bold flavors right off the bat… and though it didn’t have as much kick as I thought it would, Yakuza’s Choice was (surprisingly) very good! 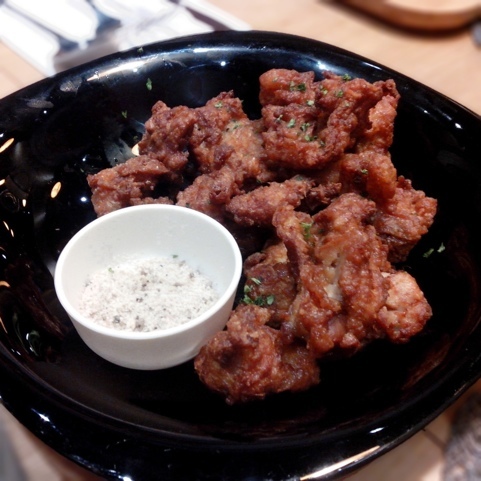 We also tried their Karaage – crispy boneless chicken that comes with salt and pepper seasoning. Though the Karaage was deep-fried, it was a pleasant surprise that the dish did not have that greasy feel. It was served hot and crunchy. I opted not to use the seasoning anymore as it was mighty tasty already. I love how the Karaage’s taste goes perfectly with my unlimited salad and ice cold Coke! 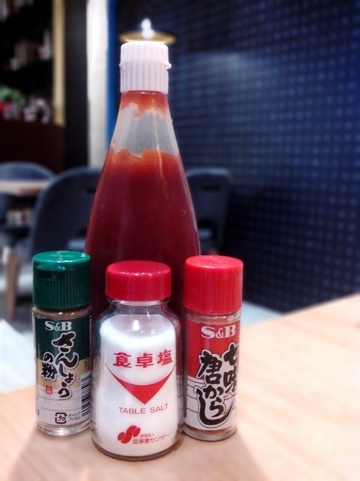 No need to use these Japanice condiments as the food were all seasoned properly. After these gastronomical pleasures, we figured that there was enough room left for a little bit of dessert. 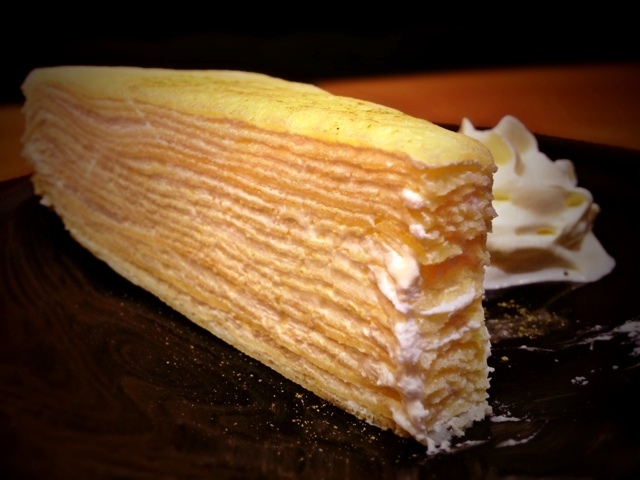 We asked for their vanilla-flavored Crepe Cake – layer upon layer upon layer of thin crepe with vanilla cream in-between that reminded me of “Milli Crepe“. I love how the cake kinda feels like it melts in your mouth. If vanilla isn’t your type, Crepe Cake also comes in Nutella flavor! Though I haven’t tasted it, I’m almost sure it’ll be just as delicious as this one. 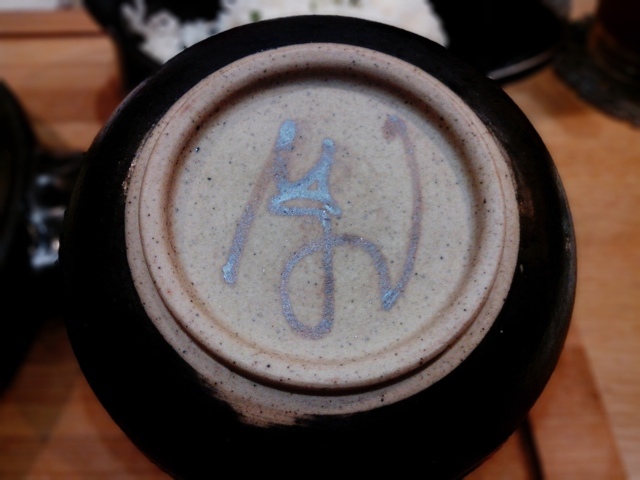 Apart from good food, I noticed they use authentic UGU Bigyan hand crafted dinnerware. Cool! If you think their food is a tad pricey, consider its quality, technique in cooking, presentation as well as the awesome ambiance and unique experience you’re buying into. 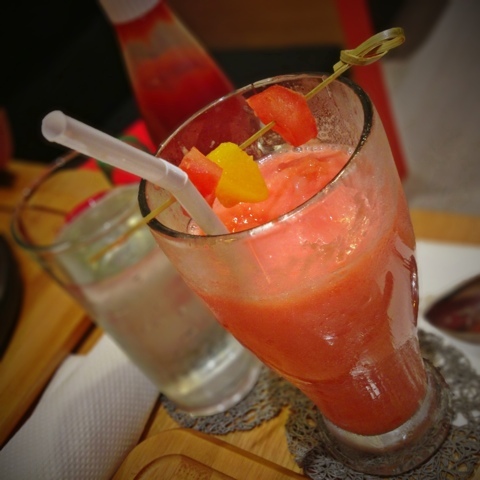 Umami Hambaagu House is very cozy and kid-friendly. So many familiar items are displayed all over the place that customers will never run out of things to talk about. I will be posting the pictures I took on a separate entry. 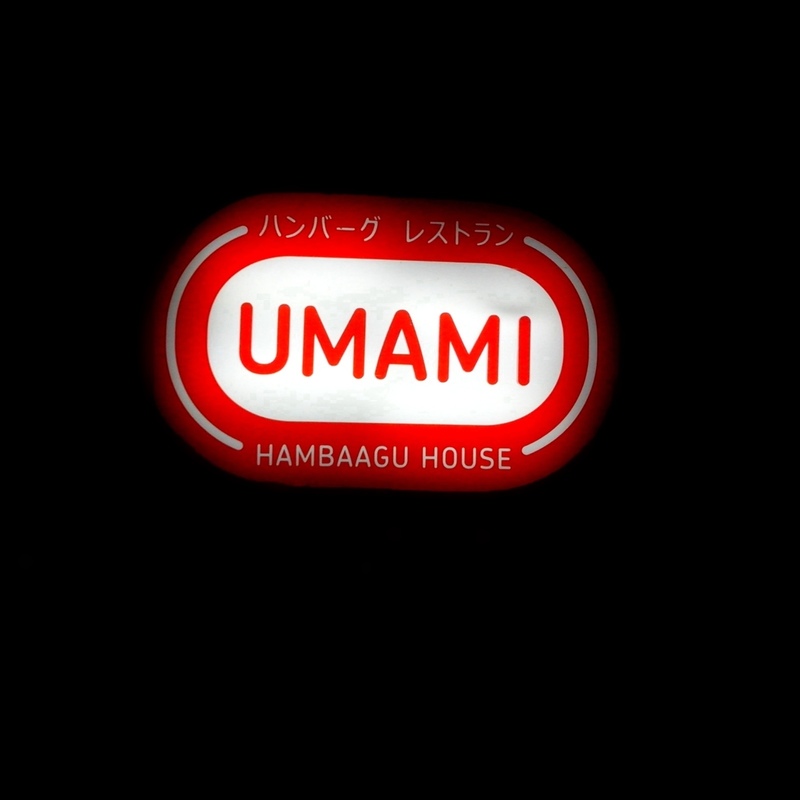 Experience Umami Hambaagu House yourselves! Click this link to know where. Nuffnang Blogopolis: 1st Biggest Blogging Event!